I love my apartment, but I’m not as enamored with some of the rules I have to abide by in order to live here. One of the major fun-killers is the ban on residents having grills on their balconies. I’ve got an amazing balcony with great views and just enough room to have a couple of friends over for some perfectly-seared steaks or mouthwatering burgers… but alas, the eagle eye of my landlord prohibits my moving a grill into the space. 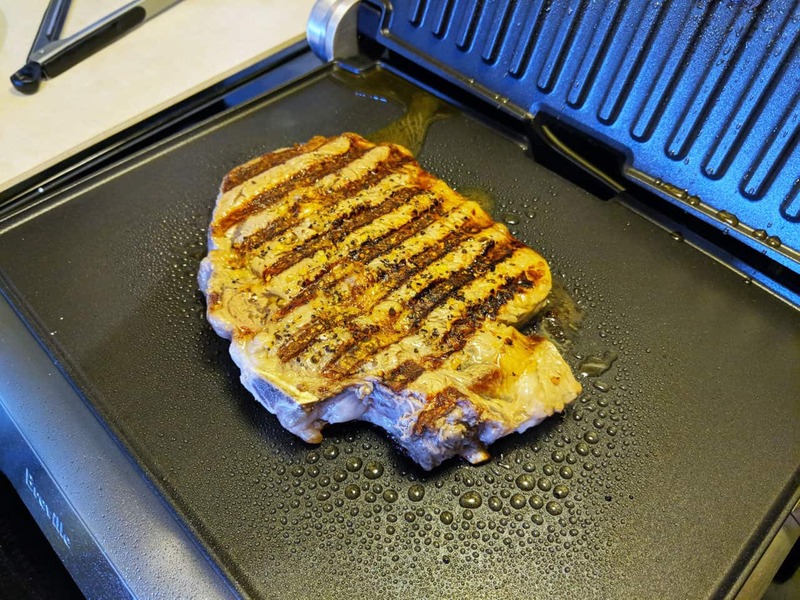 This put me on the hunt for a great indoor device that would allow me to grill delicious food indoors with zero smoke, no mess, and without taking up tons of room. 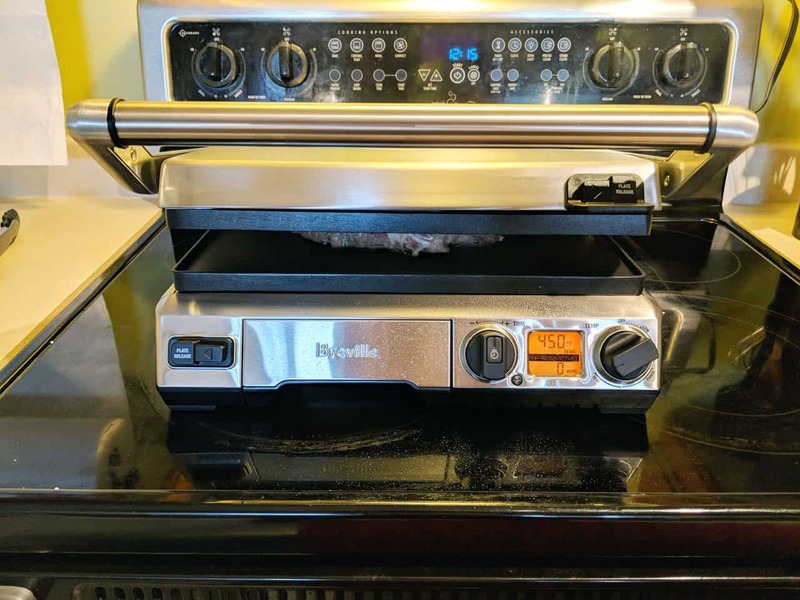 That’s how I discovered the Breville Smart Grill & Griddle. 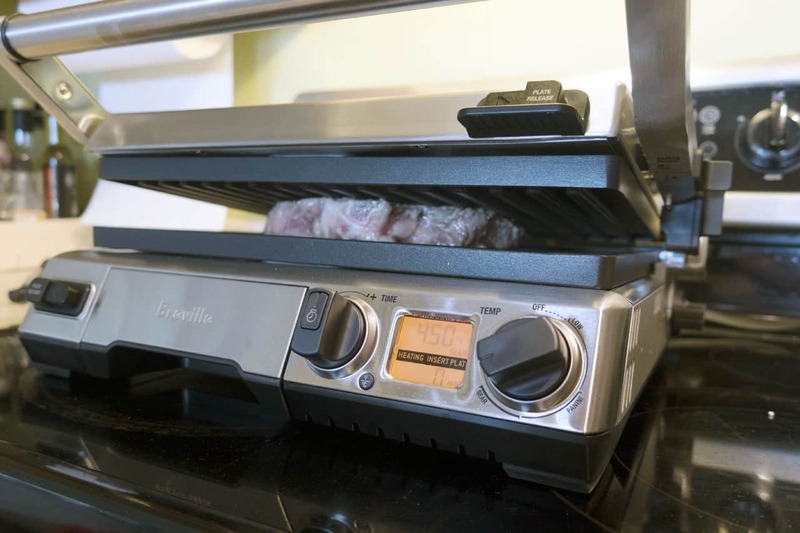 As you may have guessed by its name, the Breville Smart Grill & Griddle is both a grill and a griddle. It folds open to reveal both cooking surfaces. If you fold it over, it turns into a panini press. This is a huge plus for the limited storage space in my kitchen; I’m forever on the lookout for multi-use appliances and gadgets. When all I need is a grill – say, for juicy burgers – the grill surface heats up to a beautiful 450°F (232°C). This gives them the perfect caramelized sear on the outside while allowing me to cook them to the perfect temperature on the inside. At 1800 watts, it has enough power for anything I’d like to cook. For steak and eggs, I can grill the meat on one cooking surface, put them aside to rest, then turn the temperature down to a low 320°F (160°C) to fry tasty eggs. 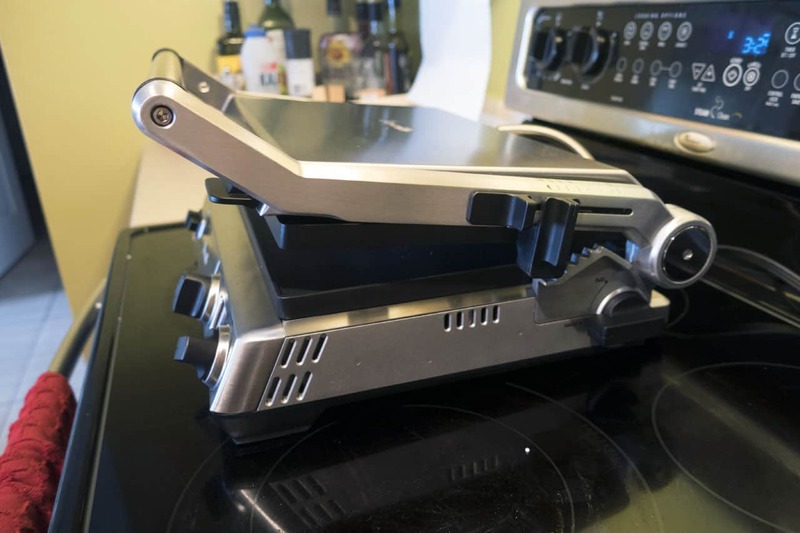 Fold the Breville Smart Grill & Griddle closed and it turns into an easy-to-use panini press. In addition to being multi-function, I need gadgets to be user-friendly in order for them to remain in my kitchen. Thankfully, the Breville Smart Grill & Griddle doesn’t take a lot of effort to use or to clean up afterwards. First of all, the cooking plates are nonstick, meaning that anything I cook lifts away easily. This means that if I grill fish or chicken, I don’t leave part of it stuck to my grill. It also means that cleanup is a breeze. Another factor that makes cleanup super-easy? The grill and griddle plates are dishwasher-safe. The cooking elements are embedded inside of them, which keeps them from getting wet. This is also one of the genius design details that helps the device heat up quickly and cook evenly. The variable temperature control allows me to adjust the temperature of whatever I’m cooking on the fly. It does take a few minutes to heat up (and I very much recommend giving it enough time to preheat if you’d like to get that nice sear on the outside of a piece of meat), but I like being able to see the exact temperature I’m cooking at with no guesswork required. Finally, I love that the cooking surfaces can be tilted slightly so that the fat runs off into a reservoir underneath the grill. This slides out to be emptied and cleaned. When I bring a new appliance on board, I’m always afraid it will end up being used once and sit there gathering dust. 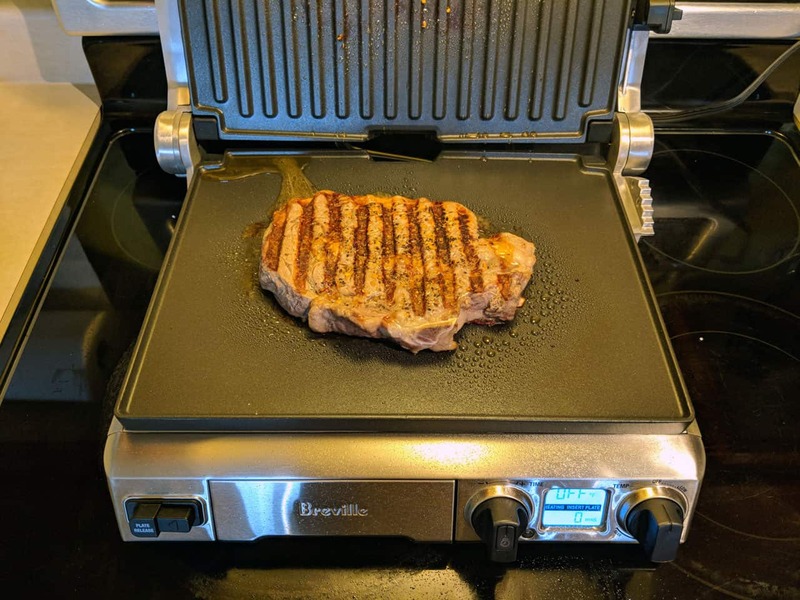 Since I’ve had the Breville Smart Grill & Griddle, I’ve used it constantly. I may not be able to grill outside, but that doesn’t stop me from creating magazine-worthy grilled meals indoors. Bon apetit!